Developed to provide human rights defenders with additional knowledge and tools useful for improving their understanding of security and protection. It is the result of over 25 years combined experience of PI’s members in working with HHRR and humanitarian law and in the protection of HRD.Available in English, French, Spanish, Arab, Indonesian and Swahili. 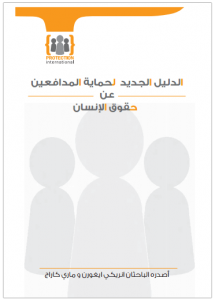 The purpose of this new manual is to provide human rights defenders with additional knowledge and some tools that may be useful for improving their understanding of security and protection. It is hoped that the manual will support training on security and protection and will help defenders to undertake their own risk assessments and define security rules and procedures which suit their particular situation. 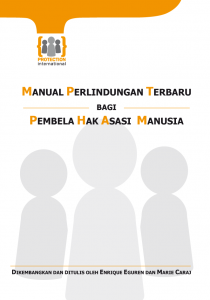 This manual is the result of over 25 years combined experience of Protection International-PI- members in working with human rights and humanitarian law and in the protection of HRD and other vulnerable groups. PI members experience originates from their former involvement and participation in Peace Brigades International – PBI-field missions and structure. We have had the opportunity to learn from and share experiences and knowledge with hundreds of defenders in the field, as well as in workshops, meetings and discussions about security. Most of the manual’s contents have already been applied in practice, either in protection work or in training workshops with defenders. This manual is the fruit of all these exchanges, and we owe the defenders involved a huge thanks for their input. Consult online the different chapters of the manual or download them below. Authors : Protection International Research and Training Unit Research and text by Enrique Eguren Fernández and Marie Caraj Protection International, 2009, 213 pages. Now available in six languages, you can download it by clicking in the image.